Confession: I am terrified of needles, or more so, the knowledge of impending pain. And that’s why I will painstakingly admit to confession #2, that even though ‘giving blood’ was on my bucket list, I really had no intention of ever completing this goal. This is when I realized that, even though I claim to always be up for a challenge, sometimes even I need a little assistance to give me the security and strength. Enter…my mom…my blood-sucking courage. 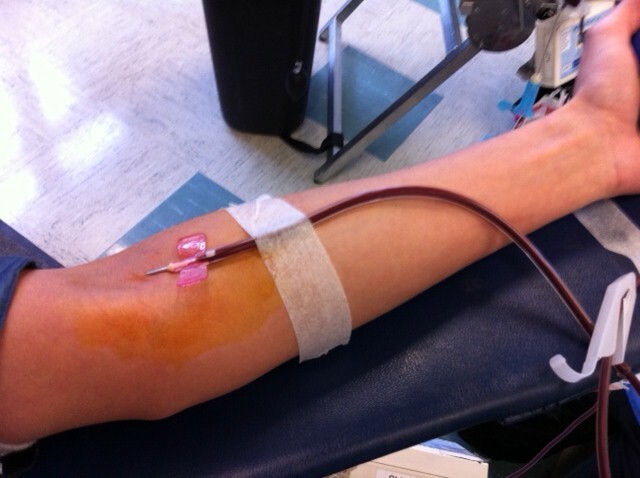 She had given blood many times before and convinced me that the feeling of saving lives would far outweigh the fear of that damn needle piercing my poor, unscathed arm. Though she said this, I was well aware that she was really just after the free catered meal that followed my blood being evacuated from my veins. We were greeted at the community center by a cordial Blood Bank of the Redwoods volunteer and the tiniest bottle of water that I had ever seen. After the minimal paperwork, which confirmed that I wasn’t a needle-sharing prostitute (phew…my husband will be happy), I was shuffled over to the nurse who was to “test” my blood for the appropriate levels of iron. Truth be told, I was hoping that I had not eaten enough leafy greens that day and would be denied for giving blood that day. Even the thought of my finger being pricked sent my heart racing, how the heck did I ever jump out of a plane? Iron Level?…Good…damn. 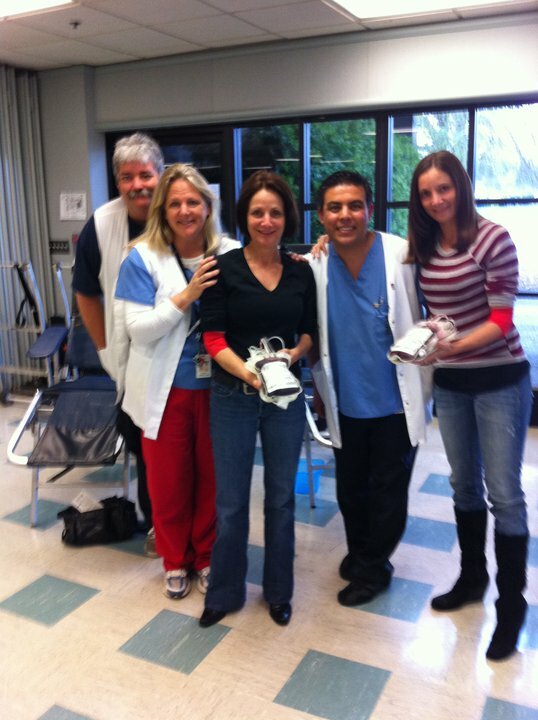 I have to give kudos to the volunteers who were so accommodating to my annoying requests; to place my chair adjoining my moms, to use the smallest needle possible while giving blood (they said they did, but may have been fibbing) and to take as many photos possible to document this once in a lifetime (literally) experience. I covered my eyes as they punctured my mom first, swearing that I was not going to look. But, by now I should know myself better. I quickly glanced over at the ‘car wreck’ that I couldn’t avoid. Damn. Damn. Damn. Why did I look? 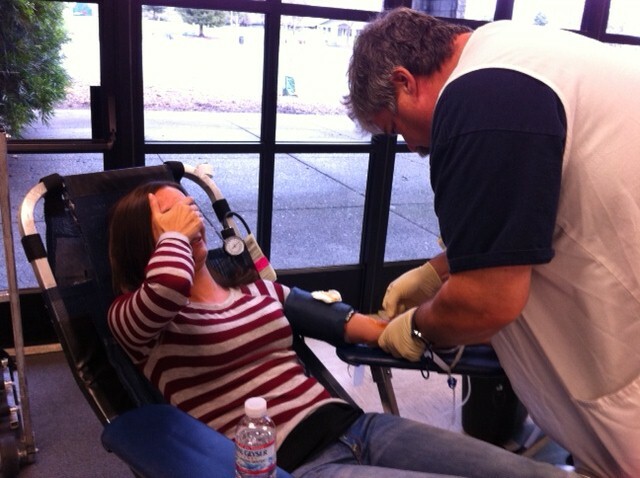 The drinking-straw-size needle (I swear) that was sticking out of her dainty arm made me want to poop my pants. The nurse swore that my needle was smaller, but her devilish eyes said differently. Turns out the anticipation was far worse than the pain, isn’t that the case most of the time? With my needle in, I was told to relax for the next 7-8 minutes until my one pint of blood (enough to save 3 lives) was withdrawn. That left me with only one last concern, fainting right after the procedure. Don’t ask where these anxieties come from, I really don’t know. I arose from my lounge chair slowly, fully expecting to feel hazy, but there was nothing. Really, nothing. We headed over to the hodge podge of grub, suited for a children’s birthday party, and I quickly reached for the Chips Ahoy feeling that I deserved to indulge in this sugary, high calorie treat. 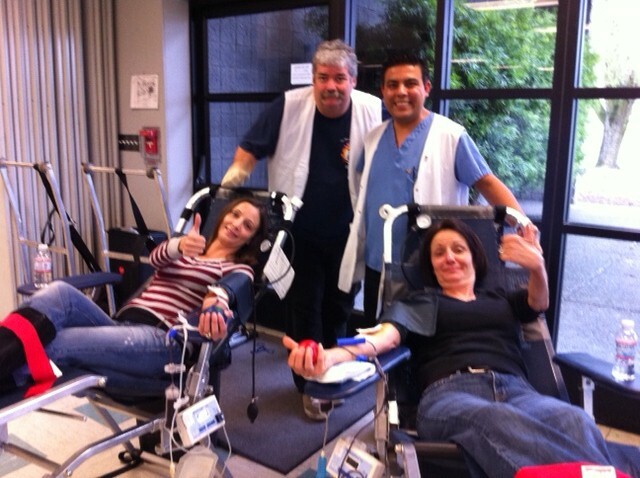 I just got done giving blood for Gods sake! 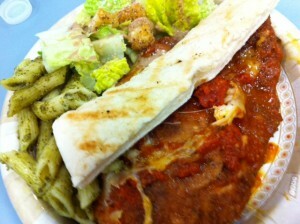 Todays blood-giving special also featured pesto penne, chicken parmesan and Caesar salad. Hello! Why didn’t they advertise this as a special deal on Groupon? Upon exit, we were warned to take it easy for the next 24 hours and drink lots of water. Believe me, I milked every minute of the “I just gave blood” cow, just short of lying on the couch watching soap operas and eating a pint of gelato (in honor of the amount of blood I just gave). A week later, I am so proud to have not let fear hold me back and grateful to my mother who pushed me through. 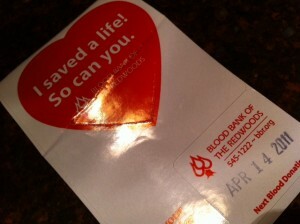 With that said, the thought of giving blood again stills makes me want to crap.